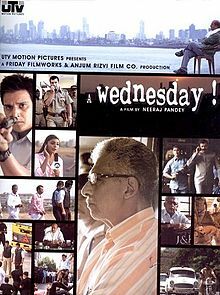 A Wednesday has been recommended to me many times since its release in 2008. After enjoying writer-director Neeraj Pandey’s sophomore effort, Special 26, this seemed like the right time to finally check out his debut film. I can see why A Wednesday — a story about a common man trying to correct the inadequacies of India’s sprawling bureaucracy — still resonates with people. It has great populist appeal. I think I would’ve enjoyed it more had I seen it before Special 26, which is more polished than A Wednesday. Nevertheless, A Wednesday is enjoyable and full of the dramatic tension that Pandey is so good at creating. The film begins with Police Commissioner Prakash Rathod (Anupam Kher) reflecting on the most challenging case of his career, on the day before his retirement. I’m not sure why Pandey has Rathod specify that this is his last day on the job. It’s not important to the plot, and it draws an unwelcome parallel to Robert Duvall’s character in the 1993 common-man’s-revenge film Falling Down. The case Rathod is referring to involves the harrowing events of a Wednesday afternoon at some point in the not-to-distant past. An anonymous caller claims to have placed bombs throughout Mumbai that will explode in about four hours unless Rathod releases four terrorists from prison. Rathod assumes that the caller — an unnamed man played brilliantly by Naseeruddin Shah — is another terrorist, but the truth is more complicated than that. While trying to find the man behind the calls, Rathod dispatches two officers to carry out the bomber’s orders: straight-laced Jai (Aamir Bashir) and loose cannon Arif (Jimmy Shergill). Shah’s character enlists an ambitious news reporter, Naina (Deepal Shaw), to serve as his eyes on the ground. Naina feels conflicted about aiding a possible terrorist, but breaking this story will get her off the dreary local news beat. The story is tense, as Rathod tries to connect the dots while helplessly giving in to the caller’s demands. There’s great dynamism in Pandey’s shots. Though many of the scenes take place inside the police control room, there’s a lot of movement. Rathod stalks the hallways; officers spring to life when the latest call comes in; Arif chases down a suspect who might have the final clue to the caller’s identity. As well-paced as the story is, there are a lot of rookie directorial mistakes that detract from the film’s overall effectiveness. Fight scenes seem shoehorned into the script, and the sound effects that accompany them are cheesy. Unable to trace the phone calls, one of the police officers makes the corny declaration: “We need a hacker!” When Shah’s character finally reveals his motives, he does so in a well-delivered but long speech that stops the film’s momentum. The ending was a bit of a cop-out. Perhaps the most distracting mistakes Pandey makes are in the inclusion of a number of ineffective red herrings that remain loose threads at the end of the film. It’s implied that Jai and Arif have a preexisting beef, but this is never explored. Jai gets several phone calls from his wife, who’s traveling with their son on a train. Though she could be in danger, Jai never warns her to stay off the train, though he does worry that she’ll be concerned for his own safety if she sees him on the news coverage of the crisis. During his confessional speech, Shah’s character reveals a personal motivation for his actions. It seemed as though this disclosure would explain why he chose Naina to cover the story, but there’s ultimately no connection. Her selection is completely arbitrary. While I enjoyed A Wednesday overall, these mistakes stood out because of their absence in Special 26. That’s actually a compliment, as it means that Pandey has honed his storytelling to augment his flair for narrative tension. Seeing Pandey’s professional growth between his first and second films leaves me very excited to see his third film, whenever that day comes. This entry was posted in Reviews and tagged 2.5 Stars, 2008, A Wednesday, Aamir Bashir, Anupam Kher, Bollywood, Deepal Shaw, Falling Down, Hindi, Indian, Jimmy Shergill, Movie Review, Naseeruddin Shah, Neeraj Pandey, Special 26 on March 22, 2013 by Kathy.